Sen. Susan Collins, R-Maine, speaks with Supreme Court nominee Judge Brett Kavanaugh at her office, before a private meeting on Capitol Hill in Washington on Tuesday, Aug. 21, 2018. As is often the case, Sen. Susan Collins finds herself the focus of intense lobbying to sway — in some cases, force — her vote. This time it is her decision on Brett Kavanaugh’s nomination to the Supreme Court. Call it the curse of being viewed as a moderate. A small portion of the “lobbying” is way out of bounds. Obscenity-laced phone calls and letters and threats to staff members are abhorrent — and ineffective. Much of the vehemence surrounding Kavanaugh’s nomination comes from a place of fear. Many in Maine, and America, are afraid that they will lose their health insurance or their civil rights if Kavanaugh become a Supreme Court Justice. Others fear, with good reason, that Kavanaugh will support increased pollution and weaken protections for workers and average Americans. These fears are real and shouldn’t simply be waved away. Kavanaugh’s nomination comes at a fraught time in America. Political discourse has sunk to inappropriate levels. Trump, who is amoral and impetuous, must be carefully handled by “adults in the room” to avoid further danger to our republic, according to a White House insider. Special Prosecutor Robert Mueller continues to investigate Russian interference in the 2016 election, an inquiry that has already led to nearly 200 criminal charges and six guilty pleas. In addition, the handling of Kavanaugh’s nomination has been a disaster. Republican leaders, in a rush to get Kavanaugh on the court before November’s elections, have short circuited the usual process. Thousands of documents have been withheld. Those that have been released were vetted by a lawyer with close connections to the president. This leaves the impressions that unfavorable information is being hidden. Democrats, who are outnumbered in the Senate, were unable to stall the process and have been left to grandstanding and political theater. All of this makes the Senate’s job of “ advice and consent” much more difficult, and divisive. All but a handful of senators had their minds made up about Kavanaugh months ago. Which has left advocates, and constituents, to focus on Collins, and fellow Republican Sen. Lisa Murkowski of Alaska, who they view as persuadable. Interestingly, the lobbying seems less intense on Democratic senators who face tough re-election battles in states that were easily won by Trump in 2016. Hoping to keep their Senate seats, some of these Democrats may vote for Kavanaugh. So, progressives have pinned their hopes for defeating Kavanaugh on two Republican senators who have shown a willingness to buck their party, a long-shot strategy at best. Left-wing groups launched a campaign to raise money for an unnamed opponent to Collins, who is up for re-election in 2020. Although it was launched weeks ago, it only caught fire days ago. The CrowdPAC fund has raised over $1.2 million in pledges. 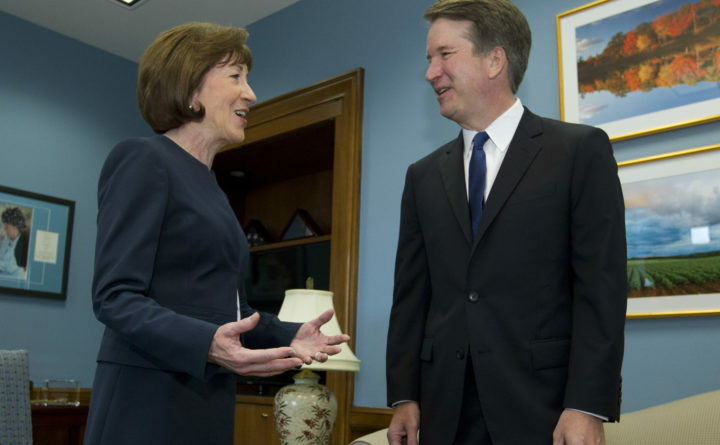 Donors’ credit cards will only be charged if Collins votes to confirm Kavanaugh, the site says. The money has come from more than 46,000 contributors, most of whom, the groups says, have given small amounts, such as $20.20. It is unclear how many of the donors are from Maine. Collins has called the fund a “bribe.” It is more akin to blackmail or coercion. It isn’t likely to be successful, but such efforts aren’t unusual. What is unusual is that the money is coming from thousands of small donors. Corporations, rich individuals and political action committees do this sort of thing all the time. Groups they fund run ads calling on elected officials to vote for or against specific legislation. Behind the scenes, they let members of Congress and state houses know that their votes on specific bills will be tracked and later used when endorsements are made. Big donors made it very clear that political donations would be shut off to members of Congress who didn’t support last year’s tax cuts. And, like the CrowdPAC funding, donations to these PACs are shielded from public view, thanks to the Supreme Court’s 2010 Citizens United ruling, which viewed such spending as free speech. Kavanaugh has an expansive view of political contributions with few limits or requirements for disclosure. This script was largely written in 2016 when Trump, who promised conservative, pro-life judges, was elected president, setting the country on its current divisive path. Our national argument over Kavanaugh’s nomination has solidified battlelines more than changed minds. That is a dangerous legacy.